Our goal at Eagle Mat when working with schools and universities is to design spaces that inspire student learning. This includes paying close attention to materials that are flexible, create engagement environments, and can handle wear and tear from the toughest weather conditions. 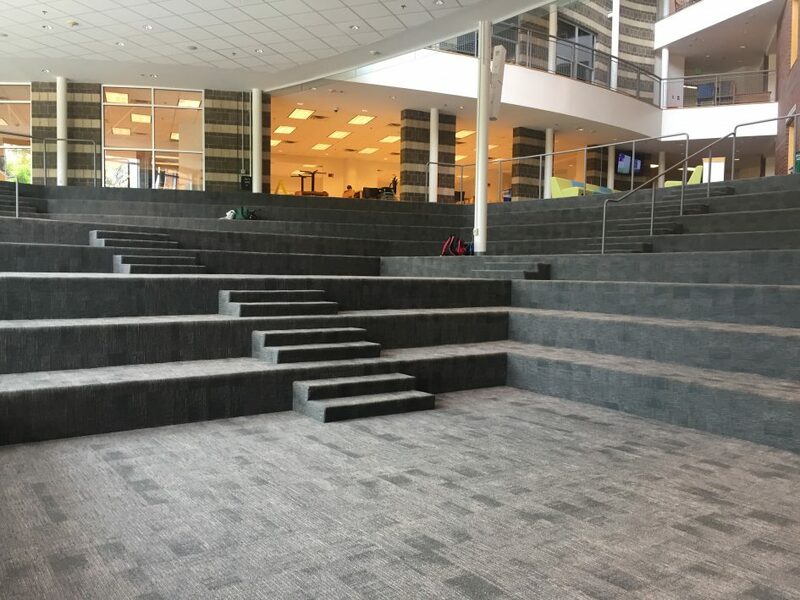 For our most recent project with the Georgetown Day School, our goals were to provide a carpeting solution that focused on high traffic areas and large-scale upholstery on numerous stairs and landings. With a tight deadline of 2 weeks before school began, we worked with their team to install the Tandus Centiva Powerbond commercial carpeting. The Powerbond is a close-shelled cushion carpet. The cushion and nylon are fused together through heat and pressure creating a floor covering that are integral and inseparable. To protect indoor environmental quality the designer should understand indoor air quality problems and seek to eliminate potential sources of contamination that originate from outdoors as well as indoors. Contemporary designers and carpet manufacturers like Tandus Centiva are still finding ways of creating innovative textiles. Tandus Centiva provides a new perspective in design with contrasting collections.